Hobo Hooroo Tour 2019 Sunshine Coast. Presented By Beats Cartel and Southern Comfort, one night of wild rock n roll fury at the Solbar! Hobo Magic shall return to the Sunshine Coast for the last time before relocating over to Europe. The only real solution for an Australian Psych Rock act who's achieved all they can nationally, in an environment not conducive to Rock'n'Roll, is to move to Europe...and this is just what underground riff lords Hobo Magic are doing after years of playing festivals, capacity tour shows and supporting pretty much every Psych/Stoner band of note who've been to this country in the last five years. Tagged by the Sydney Morning Herald as being "at the forefront of the underground scene", the Sunshine Coast power trio are loading up the wagon one last time (for now) to venture up and down the East Coast on the back of the 'Hooroo Tour', a chance for Hobo's legion of fans to catch them one last time before a lengthy overseas stint. 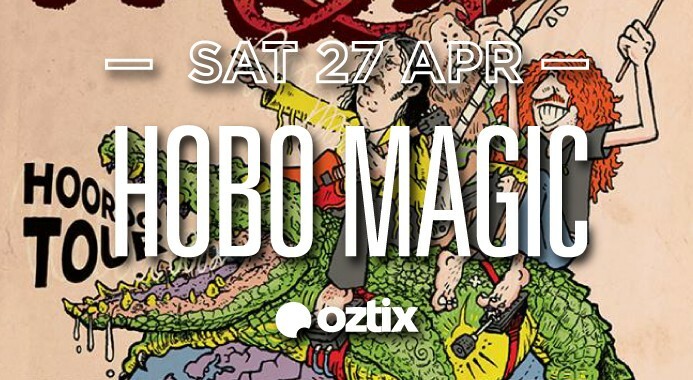 Ready for one final month long party, Hobo Magic line up alongside an awesome stack of Australian bands as they venture through NSW, VIC and QLD this March/April for one more roll of the dice before the conquering of the European festival circuit begins.